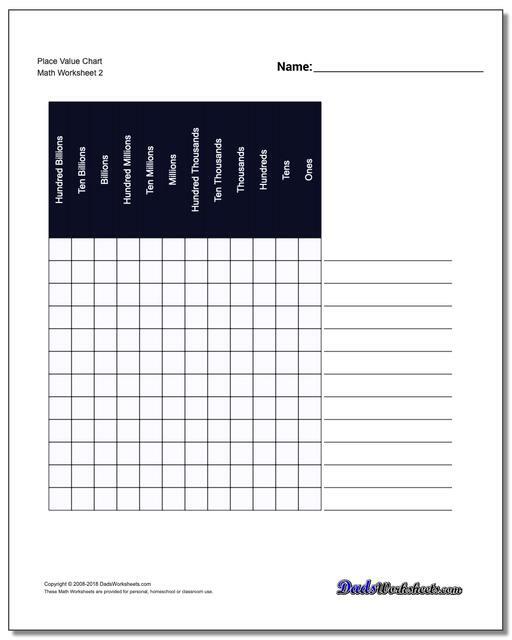 Posted by Dad on October 15th, 2015 in Charts, Worksheets Add Your Thoughts! Learning about place value is an important step in number fluency. Decomposing multi-digit numbers into separate place values can be confusing… How do you explain a 7 might mean 7, 70 or 0.7 depending on where it shows up in a number? As adults we take place value concepts for granted, but kids learning multi-digit math need a graceful introduction to the way the base 10 number system is used to represent values greater than nine. These place value charts are a great place to break numbers down and figure out which digit has what actual value. The charts at the link below have several different versions, including ones with and without decimals, so they can be introduced gradually or at multiple stages in the development of mathematical literacy. There are separate versions that include the three digit groupings (“periods”) as well as more traditional versions with each place labelled completely with it’s value. Please check them out and if you have feedback, let me know in the comments!